September 30, 2013 July 24, 2018 P.O.P. “Gun control doesn’t work”. That’s the unequivocal verdict of the NRA and its fan club. Quite often, gun lovers will back up this bumper sticker mantra with several others: “When guns are outlawed, only outlaws will have guns”; “Criminals prefer unarmed victims”; “Guns save lives”; “More guns, less crime”. “If the gun-grabbing commie government tries to take away my guns, I’m gonna blow away a whole army of ’em.” And so on. Sometimes, however they’ll also throw out facts — cherry-picked facts to support their unalterable belief that “gun control” ( a formerly respectable term that they’ve co-opted as a pejorative) not only is ineffective, but is even counterproductive. Like other cherry-picked facts (see previous post on cherry picking), the data they provide is usually not inaccurate; but it is often quite incomplete, resulting in a skewed perception of reality. Let’s take a look at a few of their favorite tactics. For purposes of this series of discussions, we’ll be referring several times to the “gun control” feature on the website JustFacts.com. That’s not because I have some kind of vendetta against the folks at JustFacts. It’s because they present in a clear and concise manner the same typical and standard arguments and stats employed by gun cultists everywhere. While the website sabotages its credibility on many topics with reverent nods to such claptrap as the Kleck “study” and “Climategate”, it does present solid (cherry-picked) facts. And in particular, I like the “gun control” graphics, which often starkly point to conclusions quite different from what the authors intended. So let’s get them six-guns a-blazin’, podner. Chances are you won’t be able to discuss gun regulation with a gunster for more than 10 minutes without him bringing up Chicago. That’s because Chicago has rather stringent gun policy, yet in 2012 it experienced 516 homicides (or, according to some sources, as high as 535)– an increase of in the neighborhood of 20 percent over the previous year (officially 433, though variously reported as 435 to 441). So clearly, “gun control” is to blame, right? Furthermore, since the city is the president’s hometown, Obama himself must be somehow behind it all. Especially since the city’s current mayor, Rahm Emanuel, was formerly Obama’s Chief Of Staff. For gun fanatics, many of whom are rabidly right-wing reactionaries, Chicago’s murderous ways are thus a triple dose of gloat juice; they’ve even been known to suggest that Mayor Emanuel is deliberately cranking up the bloodbath in order to give himself political leverage. No, really. First off, we should note that crime statistics for cities are not necessarily a reliable gauge of the effectiveness or ineffectiveness of gun laws. Cities, after all, aren’t normally surrounded by barbed wire or moats, so it isn’t that difficult for guns to be brought in from the outside. This is especially true in a city like Chicago, which can be readily accessed by residents of at least three states — including deep red, gun-totin’ Indiana. Indeed, the rest of Illinois has more lax gun laws than does The Windy City; and this is one reason that advocates for stricter gun regulation stress the need for reform at a national level. This is not to say that municipal gun regulations are utterly useless and shouldn’t be pursued. It just means that it’s difficult to assess their success or failure; and that their effectiveness itself may vary wildly. But if you want to select specific cities where “gun control” seems to have made a difference, there are plenty of them to choose from. There are, for example, New York and Los Angeles. As even a casual glance makes clear, the city’s homicide tally had been on a rather steady downward slide for 20 years; thus, it appears that what happened last year was an anomaly rather than a trend. And this is borne out by the fact that the homicide rate for 2013 appears to have dived back down again, and has been on pace to be the lowest in about 40 years! No wonder you hear a lot more about 2012 than you do about 2013 or 2011. You also hear about isolated days or weekends of exceptional bloodshed much more than you hear about the overall trend (which is almost never). This obsession with recent (though not too recent) crime statistics, and trying to tie them to “gun control” suggests that the gun lobby wants to give the impression that strict gun regulation is a recent development in Chicago. But far from it. Way back in 1982 the city passed one of the strictest of gun policies: an outright ban on handguns. And guess what? The streets haven’t become Armageddon Unlimited. In fact, at the time the ban went into effect, the city’s homicide rate had been on the rise; but since then, it has dropped 17 percent. 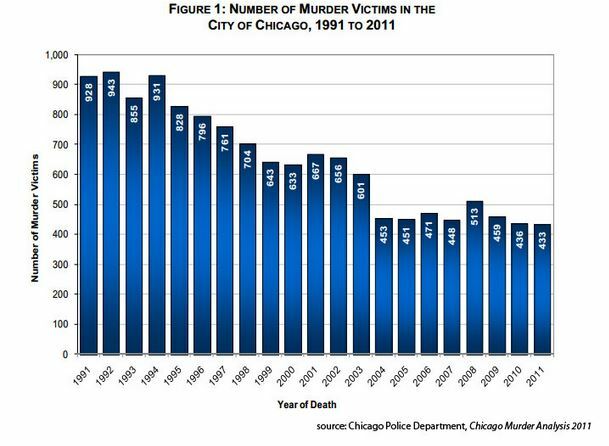 But look again at the graph above, and imagine that the little section with the sharp spike is missing, You’ll see that without it, Chicago’s murder rate would have dipped more than did the nation’s as a whole. Now here you may cry foul over the suggestion that we discard a slice of data that doesn’t fit a particular profile. The thing is if you’re going to draw a broad conclusion that “gun control doesn’t work” or even that the Chicago gun ban specifically hasn’t worked, you need to eliminate all other factors that might influence crime rates. That’s impossible to do in the real world; but as the next best thing, we can try to filter out major aberrations. Chicago’s murder spike is so dramatic that it reeks of the freak factor. And indeed it coincides with the crest of the crack epidemic, which certainly contributed to violent crime in many places — it apparently hit Chicago with its fullest force slightly later than it did other major cities. The crack phenomenon was a relatively brief period that had never happened before and hopefully will never happen again. Thus, removing it and its probable aftermath from the equation just might yield a more accurate portrait of the long-term homicide trend. Even without doing so, however, we still are left with a declining homicide trend in Chicago since the gun ban went into effect. Chicago’s handgun ban is an utter failure. Which is a bare-butted lie based solely on the apparent increase in the percentage of handgun murders among all homicides. But an increased percentage of another variable percentage isn’t necessarily an increase at all, much less a “soaring” increase. That “40 percent” figure incorporates the crack years, but even so, it doesn’t mean that handgun murders have been on the rise on a long-term basis. Despite the spin, handgun slayings have been decreasing during the past 20 years or so. The counsel for McDonald et al and the writers of JustFacts have overlooked or ignored at least a couple of key ingredients. First, the ban is hardly the only gun law Chicago has put into effect. In fact, gunsters have been known to refer to the city as the “Gun Control Capital of the Nation”. The increasing percentage of handgun killings, rather than meaning that the handgun ban has not been effective at all, might actually mean that other gun laws are more effective — especially since the total number of gun killings has been on the wane. Moreover, it’s possible if not probable that not even the percentage of handgun murders has actually increased. The figures cited are official numbers provided in the Chicago Police Department’s annual crime reports. But if you examine those official reports a bit more closely, you might notice something that never gets mentioned — certainly not by Wayne LaPierre. It was not uncommon in past years for CPD statistics to list 20 to 30 percent of gun homicides as having been committed by firearms of an “unknown” type. That percentage has shrunk considerably as the percentage of official handgun killings has increased — which strongly indicates that many handgun murders in the past escaped categorization because they were listed as “unknown”. Furthermore, 68 percent of the 1981 firearm murders (546) were committed with a handgun and 26 percent (142) were committed with guns of an unknown type. In contrast, of the 339 firearm murders for 2005, only 1.5 percent (5) were listed as “unknown”. It’s entirely possible that all or nearly all of those 142 unknowns in 1981 were actually handguns, which would bring the year’s total to as many as 516, and the percentage of total gun murders to as high as 95. Even if we only assume that the “unknowns” were distributed among the same 11.5 to 1 ratio as the officially identified weapons, that would make about 504 handgun murders, and bring the percentage of all gun murders to about 92. In sum, while we cannot prove that the handgun ban has been an effective deterrent to crime, we do know that its passage coincides with the reversal of a crime trend that had been on the rise prior to that and subsequently has been declining. When gunsters cite specific years that buck this trend, they are cherry picking. And when they bring up Chicago, they are fighting against their own cause. As more of them start to realize this, you can look for them to find another cherry-picked year in another cherry-picked city. Brilliant, as always; Logic and facts. People should pay attention. But what is your take on the 2006 Harvard study WOULD BANNING FIREARMS REDUCE MURDER AND SUICIDE? A REVIEW OF INTERNATIONAL AND SOME DOMESTIC EVIDENCE, by Don Kates and Gary Mauser? They offer some strong evidence to show that the presence of guns, from a broad epidemiological perspective, is not linked to violence. I’ll be addressing this in a future installment in this series. The short answer is: more cherry picking. thanks again POP for supplying a logical explanation for all of the counterintuitive claims from gun advocates, that during times when guns are regulated, the occurrences of gun crimes goes up. This is especially evidenced in the overall trends of gun crimes in Chicago, rather than just cherry-picking the numbers from 2012—not to mention the fact that cities like Chicago represent small pockets where gun laws are in effect, and where people from surrounding counties and States, can easily bring guns already purchased into the city. One thing I remember about the (1993 ?) gun control bill that Clinton passed, is that he had to make so many concessions and attach so many riders to the bill to satisfy special interests, that, it was effectively rendered toothless. I believe one of the conditions required to pass the bill, was that the government could do no new research about the effects of gun control. What in the name of the NRA could possilbly require needing such a blatant provision—obviously intended to squelch honest research? My guess is that gun advocates are fully aware that their own assertions can easily be disproven—so there was, (in 1993) nothing like some good old censorship to prevent that embarrassment! I have learned over the years, that websites which are fond of titles like JustFacts.com. or phrases like “the plain truth,” are actually the most likely to include unfounded spins resulting form cherry picked, or even outright manufactured information. When Cherry picked, they fool many of us because the basic stats are valid, but not in context of long term trends (as you so readily pointed out). Keep up the good work! We all need to hear the truth once in a while! If I understand your argument correctly, you’re saying that violent crime and gun homicides in Chicago have been going down over time. But Chicago’s Mayor and Superintendent of Police regularly point to the same data and claim that more gun restrictions are needed to attempt to reduce the number of shootings in the city. You conclude that Chicago’s gun control measures may or may not have contributed to the long-term decline. Are you arguing against Rahm Emanuel and Garry McCarthy? How would anyone arrive at that conclusion? Nobody has claimed that there is no crime in Chicago at all, and as long as there is crime there is a need for crime fighting measures. Particularly if we assume that the handgun ban did indeed contribute to the crime drop, and it has now been overturned. Very simply. The political leadership in Chicago has been pointing to the number of homicides in 2012 and calling for more and/or reinstated restrictions on gun ownership. Your article suggests that homicides in Chicago are dropping for any number of reasons, and correctly avoid stating that the handgun ban was a cause of that decline. So, wouldn’t the advice to Emanuel and McCarthy be to focus on the day-to-day crime-fighting police work and improvements in the economy and living conditions in Chicago as has been happening, too, over the past 30 years, rather than picking fights about gun control? You just restated and re-answered your own question. Yes, the crime rate has been dropping over the past 30 years. Yes, there was a jump in homicides in 2012. Yes, it would be a good idea to prevent that from happening again. Yes, there are many ways to approach that. Yes, “gun control” is one of them. Obviously there is no virtue in suspending efforts to curb gun violence, just because the overall trends concerning gun violence in chicago are going down. A good analogy might be a hypothetical situation, where, once the allies are about to deliver a decisive blow to HItler and take over the city of Berlin—thus being within reach of ending an extremely violent and cruel war—they then decide instead, that because the allies have been successful up to this point, there is no reason to fight further, and should instead, just withdraw before completing their final battle and capturing and/or killing Hitler? 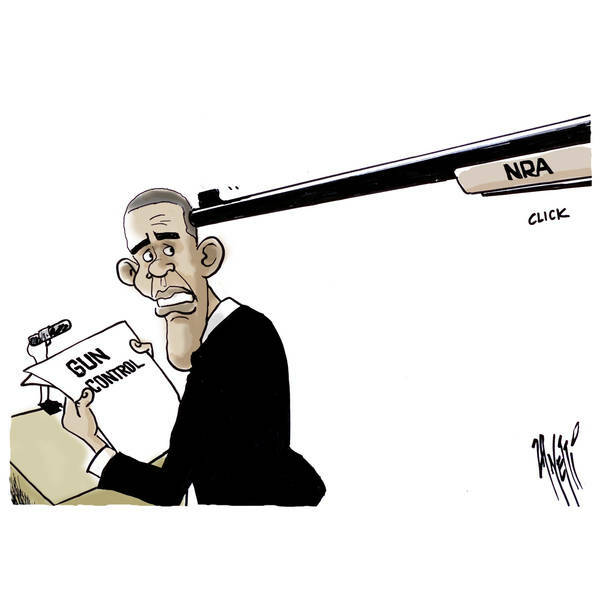 Whatever your premise and point are, they don’t have any relevance to the actual worth of trying to end gun violence. In that field what works in Chicago, works in Chicago, and it would be senseless to suspend gun regulations or try to avoid effectively lowering the rate of gun crimes there, just because Chicago’s gun crime trend is gradually going down. If one realistically points out that perhaps other causes have also contributed to lowering crime rates, such an accounting does not at all imply that the primary catalyst is not directly related to the use of sensible gun regulations. 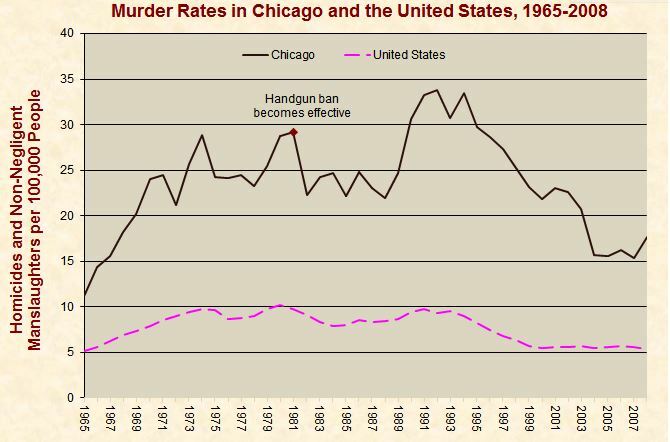 And, if you are implying that overall trends which reveal diminishing gun crimes, are lacking in positive proof, you would then be ignoring the great and apparent possibility that gun regulations in Chicago have accomplished exactly what they were intended to. If anybody lacks convincing evidence, or is interpreting it wrongly, the most likely candidates for such mistakes are obviously made by those analysts who are NRA inspired. Gun promoting people who insist on cherry picking the statistics from 2012 in order to imply that gun laws are not working at all—have created the most glaring mistakes of all! Are you now saying that yes, Chicago’s gun restrictions were responsible for the long-term decline? I am now saying exactly what I said in the article: that there is no way we can know for certain, but there is a definite correlation. I would like to add, that, noticing the correlation of a long term decrease in gun violence which happens to coincide with gun regulations in Chicago,is a lot better way to determine the truth, than to take one year of increased gun crimes (2012) and use that cherry picked information to claim that gun regulations have no effect on crime, or make it worse. You understand that correlation does not equal causation, and that adding another variable to a regression model never reduces the R-squared. So, while the NRA can’t point to 2012 and say that Chicago’s gun restrictions caused the jump in homicides, the question of whether the gun restrictions helped in the long-term decline is open to debate. If Chicago’s gun restrictions were a significant influence in the city’s declining homicides, then we might see similar behavior in other cities, or the opposite if there were few gun restrictions. Houston, which was itself the murder capital of the US in the early ’90s, and is also a very large city with an ethnically, culturally and economically diverse population, had a decline in homicides over the past twenty years, too. Houston not only doesn’t have Chicago-style restrictions on guns, it lies in Texas, the gun Mecca of America. If Houston saw a decline in homicides, despite gun shops, gun shows, and gun carriers, wouldn’t it support a claim that guns restrictions don’t have much to do with declining homicides? I do understand that correlation does not (necessarily) equal causation and I would assume that same uncertainty also applies to the reverse situation in which gun regulations are enforced and gun crimes increase anyway. The salient point in the POPs article is that, gun advocates deliberately cherry picked chicago’s gun crime statistics for 2012 in order to discredit the case for gun regulations—without any solid proof. I also didn’t hear the POP claim that since statistics actually revealed an overall decline over the last 30 years that this established the absolutely positive influence of gun regulations (beyond a shadow of a doubt). I am not a statistician, but the research I have done into gun studies does point to the fact that, coming up with indisputable data in situations which really cannot yield completely reliable information is doubtful at best—since it is virtually impossible to provide double blind studies and create and analyze parallel groups of factors in other city or areas. However, the POP’s article made it completely clear that studies done by gun advocates—often with the support of the NRA—do indeed, deliberately distort results by cherry picking data intended to provide supposedly indisputable results. The fact is that we will never have 100% accuracy, but, since I haven’t read about Houston’s decline in gun crimes, I should hesitate to comment about it, but there too, it is entirely possible that a twenty year decline was NOT the RESULT of having a lack of gun regulations either. If causation cannot provide objective correlation, then Houston’s decrease in gun crimes, despite allowing gun shows, gun shops and licenses to carry, may well NOT come from a LACK of regulation either! The way I decide who is most believable, usually involves the fact that those who report the problem, openly admit that their methods are not infallible. The POP doesn’t claim to be an infallible authority, but many of his points are affirmed by websites that objectively report the unreliability of many major gun studies—such as FactCheck.org. If you go to that site, you will find that subsequent research has revealed many unknowns that were not fully addressed in many of the studies which claim that, gun regulations have absolutely no effect on crime.Therefore, these studies are also in doubt. In general, fact checking organizations find no absolutely reliable way to decide whether regulations reduce gun crimes or, raise it. Personally though, I find it counterintuitive to conclude that gun regulations make absolutely no difference in the frequency or number of gun crimes. It is also obvious to me that many of the pro gun sites that glorify the unregulated use of weapons, do not avail themselves of studies that are even remotely objective, and, that can indeed, be discredited by the kind of common sense approach and fuller use of data which the POP makes use of! Thanks for the great reading on your archive. I want guns to somehow work within, not destroy, the USA. And Robert Levy was publicly critical when it didn’t pass. This means the NRA is, well off the reservation. Levy and the Cato Inst. set up the Scalia/Heller decision, says Tom Diaz in The Last Gun. Sen Schiff’s bill addresses liability! Have any comments, P.O.P.? Yes, I have had and/or will have. I believe I’ve already touched on the matter of Gottlieb’s comments somewhere, but it’s worth addressing again in some of the future posts I have planned. As for gun liability, I think it’s a great idea, though I’m not yet familiar enough with the Schiff bill to discuss it specifically. Stay tuned — I’ll certainly have a lot more to say about guns in the days ahead.